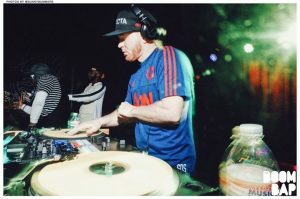 Check out the latest Event Recap of THE BOOM BAP Nashville: Featuring DJ METROGNOME at The Basement East on Saturday, December 17th, 2016—with recap photos and official poster prints for sale. 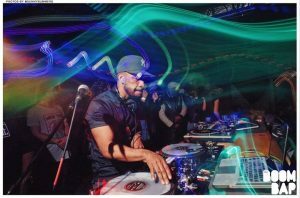 Check out the latest Event Recap of THE BOOM BAP Nashville 9 Year Anniversary Featuring Prince Paul at The Basement East on Saturday, January 28th, 2016—with recap photos and official poster prints for sale. 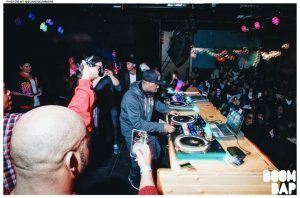 Check out the latest Event Recap of The BOOM BAP Nashville: Featuring DJ BEE at The Basement East on Saturday, February 25th, 2017—with recap photos and official poster prints for sale. SATURDAY March 25th @ THE BASEMENT EAST Nashville, TN — This month marks the first of a series we are starting called "The Legends Series." This series will consist of guest DJ's that we feel have made above average accomplishments in their careers and are considered Legends in the game. 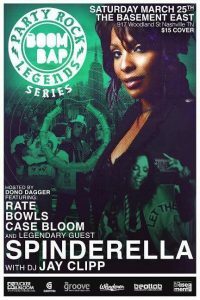 We are SO happy to present your legendary guest DJ this month.... DJ Spinderella of Salt N Pepa!